Online calculators such as http://www.csgnetwork.com/degreelenllavcalc.html (view page source) use the below formulas to get meters per degree. I understand in general how distance per degree varies depending on latitude location, but I do not understand how that translates to the below. More specifically, where do the constants, the 3 "cos" terms in each formula, and coefficients (2, 4, 6; 3, and 5) for "lat" come from? e2 = (2 - 1/f)/f = 0.0066943799901413165. These are multiplicative corrections to the spherical values of M and N, both of which equal the spherical radius a, which is what they reduce to when e2 = 0. At the yellow point at 45 degrees north latitude, the blue disc of radius M is the osculating ("kissing") circle in the direction of the meridian and the red disk of radius N is the osculating circle in the direction of the parallel: both discs contain the "down" direction at this point. This figure exaggerates the flattening of the earth by two orders of magnitude. The radii of curvature determine the lengths of degrees: when a circle has a radius of R, its perimeter of length 2 pi R covers 360 degrees, whence the length of one degree is pi * R / 180. Substituting M and r for R -- that is, multiplying M and r by pi/180 -- gives simple exact formulas for the degree lengths. Accordingly, we can understand the calculations in the question to be approximations (via truncated trigonometric series) to the formulas given above. (You may guess how p4 enters the formula. :) The closeness of these values to the parameters in the code attests to the correctness of this interpretation. This improved approximation is accurate to much better than one part per billion everywhere. 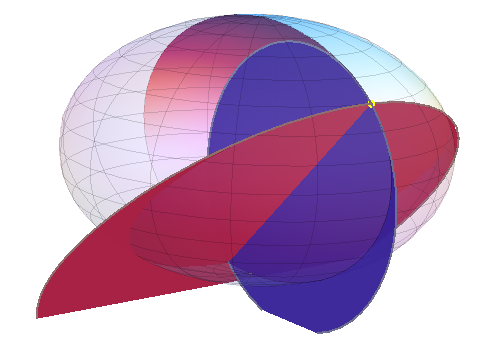 # Radii of meridians and parallels on a spheroid. Defaults to WGS84 meters. # Input is latitude (in degrees). # Approximate calculation. Same interface (but no options). 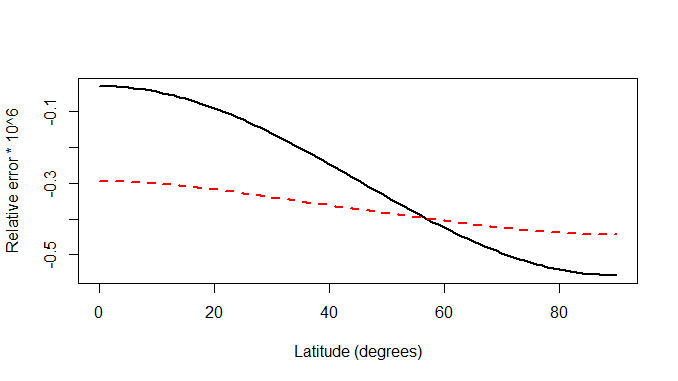 # correct formula and plot it as a function of latitude. That's the Haversine formula, though expressed in an odd way. Not the answer you're looking for? Browse other questions tagged convert latitude-longitude gis-principle length or ask your own question. How to add meters to EPSG:4326 coordinates? How can I calculate the distances between my points in sequence automatically? Convert area in pixels to acres? How to convert degree 2 utm in mysql?